Whether you want to punch through the scrum start the second the whistle blows, or have the power to move another blocker at will to create offensive opportunities, you’ll want to power up with plyo to make it happen! What the heck is plyo anyway? Short for plyometrics, it’s the style of training where you extend a muscle under load before rapidly contracting it. In plain English, that means JUMPING! 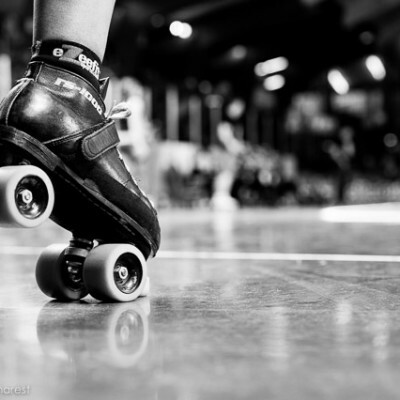 While it’s true that most of us rarely jump in our skates (apex jumps aside), it’s also true that the fast twitch muscles involved in jumping are exactly what we need in order to be effective on the track. This is true for blockers as much as jammers. You’ve probably tried some form of this before, whether you knew what to call it or not. Exercises like squat jumps and burpees, when done with great form, could fall under the plyo heading. Form Focus #1: focus on the explosive nature of each jump. Don’t just hop; really imagine getting maximum hang time, full extension of your body down through your toes, and as much distance as possible between your toes and the floor at the top of your leap. Form Focus #2: make your downward motion (the bending part of the movement) more rapid. 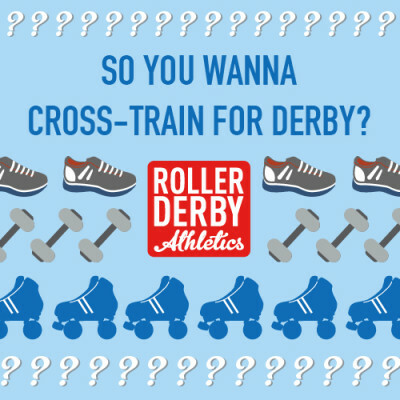 Imagine doing a simple vertical leap (such as you would find in the RDA Standardized Roller Derby Fitness Test, for example). If you make the downward motion into the bent knee position (let’s call it the pre-jump) really quick, it will create a higher resulting jump than if you bend slowly. However, a couple of the exercises in the video I’m showing today require starting from a bent knee position. In those cases, you’ll have to focus on Tip #1 alone. To give you something to practice with, I’m stoked to share this little peek into one of our advanced-level plyometric exercises from the StrideBooster program which is available to skaters in our MVP training plan. 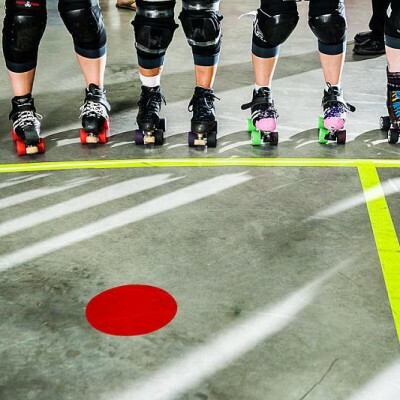 StrideBooster is designed to build your explosive power, quickness and agility for blocking or jamming. It’s not for everyone though! 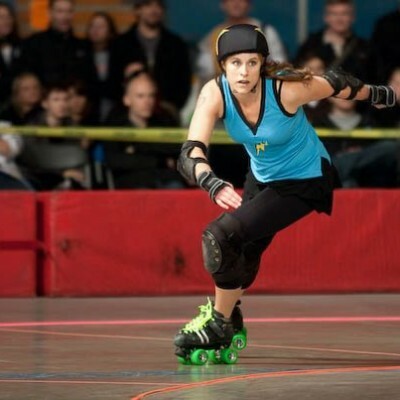 If you’re just getting started with cross-training for skating and derby, or if you feel like these intense plyo moves are out of your league just yet, then consider the StrideBuilder program instead – it’s designed to build your lower body strength so you’ll be ready to tackle this type of intensity soon. Do: Get low to start every jump. Power up as high as possible and tuck both knees to chest. Attempt to stick the landing each time. Don’t: do these without a very good warm-up. Easier: take more rest between jumps. Harder: ummm, these are already pretty hard, dude. How to Add These to Your Training: Try a routine of one or two sets each of 5 to 8 reps of each of these jumps (resting between sets) no more than once or twice a week. Land softly with bent knees. Wear good training shoes with some cushion to them. Be kind to your body and your joints! Don’t practice plyo moves every day. Your body needs rest time. Once or twice a week is a good guideline for most athletes during your on-skate season. Ideally, you would do a plyo session on its own, after a very thorough warm up. In other words, avoid doubling up plyometric training with a heavy strength training session. That said, it’s also OK if you and your team want to add some plyo training as a group before or after practice – just keep the volume relatively low. 10 minutes of training with plenty of rests between jumps will show you results without killing you. You need to have a baseline of core and lower body strength in order to jump safely and effectively. If you feel unstable during the movement, feel pain in your joints or back, or can’t get much air, put the plyometrics on hold and focus on strength training for a few weeks first. I said it above but it’s worth repeating: warm up very very well before attempting plyo training! 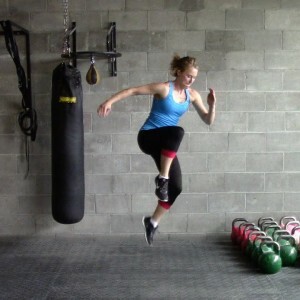 Give these crazy tuck jumps a shot and see how you can power up with plyo! If you’re not killing them just yet, don’t despair – this just gives you something to work toward!